First, go to the SHOP page and pick your standing or space-saving countertop BottleLess water cooler. Or, we’d love to hear from you if you have any questions or would like to order by phone: 800-515-0324. All coolers supply instant ice cold pure water to cool you off on a hot day – and steaming hot water for tea and instant soup. Our coolers are built to last and include everything you need: your first water purification system (certified for 1,200 gallons), installation kit, and step-by-step instructions. We’ll ship your cooler out right away to your home or office via UPS. OK – your bottleless cooler’s been delivered. It’s time to get it set up. Either you can install it yourself or we can do it for you. If you do it yourself, you’ll use the included installation kit and follow our step-by-step instructional videos and manuals. If you are switching from renting a competitor’s bottleLess to owning a cooler from bottleless.com, set up is really easy. The current bottleLess water cooler just needs to be unplugged from the water connection – and the new BottleLess water cooler needs to be plugged in to the existing waterways. If you’d like to have one of our technicians install your new cooler for you, no problem. Just Add Cooler Installation to your shopping cart (only $199) while you are buying your cooler. 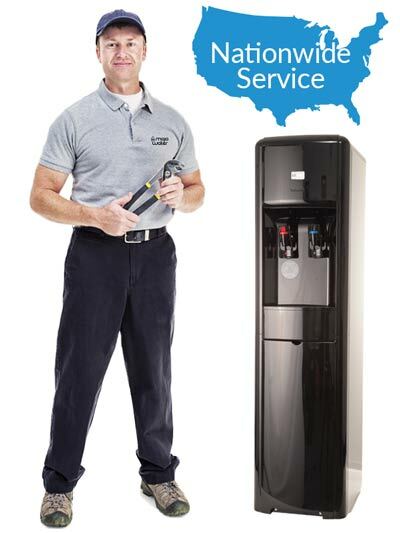 If you are replacing an existing bottleLess water cooler: BottleLess.com has a “Set Up Service” for only $99 if the waterway is already in place. We’ll come out and set up your cooler for you when a complete installation isn’t necessary. Now that your cooler is installed, just enjoy unlimited pure water at the press of a button. Enjoy your 8 glasses a day – without the hassle, environmental waste or expense! Your cooler is designed to be virtually maintenance-free, so all you need to do to keep the water pure is change the twist-off filter twice a year. Easy! Our state-of-the-art filtration removes chlorine, chemicals, lead, cysts, and other elements that cause bad taste and odor, leaving you with delicious water that’s as pure as bottled with none of the cost or hassle. It’s only $49.95 per filter change! To keep your water pure, all you have to do is change the filters. How often do you change the filters? A small office or a home will change the filters once a year. A medium to large office, will want to change the filter twice a year. It’s only $49.95 per filter change – but that is discounted when you buy 2 or more. Just twist to the left (to remove it) – then twist a new one to the right. It takes about 4 minutes (or less). We’ll send you an email reminder and you can get them right on our website. Why Is This A Better Way? Why is the Bottleless.com way better? 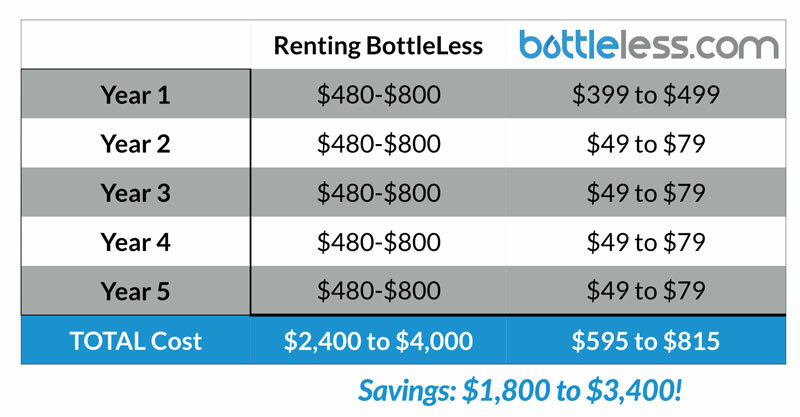 Just compare the savings of a Bottleless.com cooler to renting. Let’s say their cooler rents for $40/month – or $480 a year. In your first year, you’d pay them MORE than what it could cost to OWN one Bottleless.com cooler. In years 2, 3, 4 (and so on), you’re still obligated to pay them the $480. But an Bottleless.com Cooler has one ongoing expense – changing the filters once or twice a year. Each filter change costs only $49.95 (or less, if you buy 2 ore more). You’ll easily save over $1,000!